Every week during the season, I'll be posting a summary of the Saints' game, complete with key stats and a "Good, Bad, Ugly" performance review. If you have ideas or feedback, please feel free to submit those to me via blog comment, Twitter, Facebook, email, text, message in a bottle or whatever floats your proverbial boat. *numbers in brackets [ ] represent game totals; numbers in parentheses ( ) represent Saints' season totals. 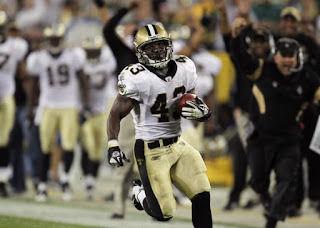 * Darren Sproles made an immediate, significant contribution in his Saints' debut. His performance was standout, and could not have been more impressive. Without Sproles, the Saints likely would have lost by 20+ points. Sproles logged 32 offensive snaps, compared to 26 for Pierre Thomas and 19 for Mark Ingram. In the first quarter, Sproles caught a key pass on 3rd and 6 for a 36-yard gain that led to the Saints' first TD of the season, and cut the lead to 14-7. Sproles then returned a punt 72 yards for a TD; he returned a kickoff 57 yards that led to a TD that cut the lead to 35-27; drew a pass interference on the game's penultimate play that gave the Saints a chance to tie the game; totaled 7 catches for 75 yards; and amassed an absurd 250 all-purpose yards on 13 touches (19.2 yards/touch). What a performance. * Devery Henderson had one of his more impressive games in recent memory. Stepping up for both Lance Moore, who missed the game with an injury, and Marques Colston, who was seemingly rusty after a less-than-active preseason, Henderson totaled 100 yards on 6 catches for 1 TD. What's more is that Henderson quieted the idle offseason chatter that he was destined to be a cap casualty. 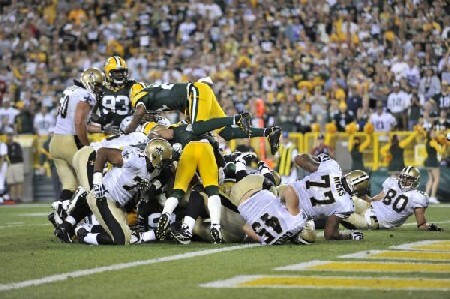 Henderson's TD came during a key stretch in the third quarter when the Saints found themselves trailing by 15 points. Henderson beat his man down the left flank, then deftly managed the sideline for a sweet 29-yard TD. * Drew Brees quietly produced a phenomenal game totaling 419 yards, 3 TDs, 0 turnovers, 65% completions, and a 112.5 rating. More importantly, Brees' composure, poise and calm, steady leadership kept the Saints in the game despite trailing by 14 points in the first quarter and 15 points in the fourth quarter. * The Spirit of Resiliency is a defining trait of the Payton era. Despite the poor defense, the special teams lapse, the red zone impotence, and a killer fumble in the first quarter, the Saints still had an opportunity to tie the score on the game's last play--on the road against the defending champs. This is not a team easily discouraged, and the Saints will be a team to reckon in the postseason. * The Defense perhaps shouldn't be judged so harshly in light of the fact that this was the first game of the season against one of the league's deadliest offenses. But regardless, the tackling continued to remain suspect and the pass defense was poor. Even though Aaron Rodgers threw several passes that were essentially indefensible, Saints' defensive backs--notably Patrick Robinson and Roman Harper--seemed to be either out of position or slow to react. Harper, in particular, remains a noticeable liability in pass coverage and offensive coordinators league-wide will be seeking to exploit this well-publicized flaw. If Gregg Williams doesn't make the necessary adjustments, this is an issue that will haunt the Saints all season long. * The Line Play was perhaps the most unexpected reality to emerge from this game. With consideration to the Saints all-pro interior offensive line and the offseason acquisitions of defensive stalwarts Shaun Rogers and Aubrayo Franklin, both the offensive and defensive lines were outplayed for the much of the game. Drew Brees faced a constant barrage of pressure and Packers' nose tackle BJ Raji consistently outmanned the Saints' interior line. The Saints' defensive line continued the unwanted trend of producing minimal pressure and Shaun Rogers, in particular, was a non-factor. Most disappointingly, on the game's final play, the Packers' defensive line won the game's most essential battle, stuffing Mark Ingram on the goal line as the Saints attempted to tie the game. * The Saints' Red Zone Offense was, in a word, putrid. In total, the Saints converted five red zone opportunities into 13 points. By contrast, the Packers converted four red zone opportunities into 28 points. If you're looking for the defining statistical benchmark of the game, this is it. More specifically, and disturbingly, the Saints reached the Packers' seven yard line in the third quarter only to see Brees take a thirteen-yard sack on 3rd and 2 and the Saints settle for a 38-yard FG. Not much later, again from the Packers' seven yard line with six minutes remaining in the third, the Saints (trailing 35-27) were stuffed on 3rd and 1. Brees then threw an incompletion on 4th and 1. The Packers took the change of possession and drove 93 yards for a TD. This was the key sequence in the game. Finally, with an opportunity to tie the score at the end of the game, the Saints were stuffed on the goal line on the game's last play. After five seasons, short yardage, red zone conversions continue to befuddle Sean Payton and the offense. On Thursday night, the disparity in red zone efficiency swung the outcome in the Packers' favor. * Marques Colston's Broken Collarbone was the worst news to emerge from the aftermath of the game. While making a critical, 23-yard diving reception on the game's last drive, Colston landed on his right shoulder and fractured his clavicle. Colston will miss a minimum of 4 games. With the health status of Lance Moore yet to be determined, the loss of Colston might be amplified. In 2008 when Colston missed 5 games with a wrist injury, the Saints went 1-4.